"Two brand new Boeing 737 Max 8 airplanes crashed in 5 months. If China has grounded all 96 of its 737 Max 8s, then Southwest, American, and United Airlines should really do something to reassure the American people that its 737 Max 8 airplanes are airworthy or ground them too," Maryland resident Eugene Gu said on Twitter. A growing number of Americans are expressing similar doubts on social media, and some are cancelling or rebooking flights on this single-aisle aircraft, which accounted for one-third of Boeing's profits in 2018. 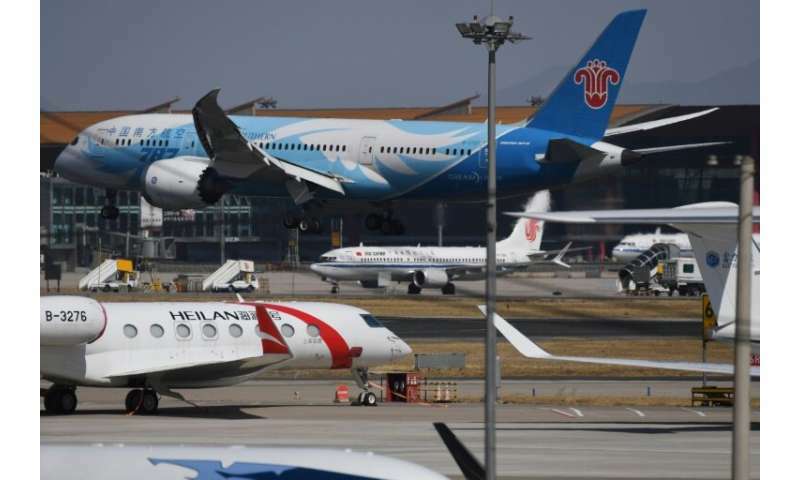 The European Union, Britain, Germany, France and China are among the governments that have banned the plane from their airspace, and the Twitter hashtag #GroundBoeing737max8 was created to urge the US authorities to do the same. The company's share price continued to lose ground, dropping more than 6 percent on Tuesday after the 5 percent loss on Monday. Southwest Airlines and American Airlines have been swamped with calls since the crash of an Ethiopian Airlines 737 MAX 8 on Sunday shortly after takeoff, which killed all 157 passengers and crew. In the wake of a similar crash in October of a Lion Air flight in Indonesia, many American passengers are not waiting for the investigations to conclude. "We are fielding some questions from customers asking if their flight will be operated by the Boeing 737 MAX 8," Southwest spokeswoman Michelle Agnew said, adding that, as usual, the airline allowed re-booking at no charge. That is not the case at American Airlines, which charges a fee for any change or cancellation, a spokesman said. The cost ranges from $200 for domestic flights to $750 for international flights. And "fear" is not recognized by travel insurance as a reason to reimburse passengers for a flight cancellation. The Association of Flight Attendants formally called for an investigation by the US Federal Aviation Administration. "In the wake of a second accident, regulators, manufacturers, and airlines must take steps to address concerns immediately," it said. Senator and presidential candidate Elizabeth Warren said, "The FAA should follow their lead, reverse their decision, and immediately ground this plane in the United States until its safety can be assured." And Senator Mitt Romney said on Twitter, "Out of an abundance of caution for the flying public, the @FAANews should ground the 737 MAX 8 until we investigate the causes of recent crashes and ensure the plane's airworthiness." President Donald Trump weighed in with a blistering tweet, saying "Airplanes are becoming far too complex to fly." The FAA said Tuesday the investigation of the latest crash continues, and it "will make decisions on any further steps based on the evidence." In the wake of the Lion Air crash, the FAA ordered Boeing to update its manual and training requirements and complete "flight control enhancements," including to its stall prevention systems, no later than April. Boeing chief Dennis Muilenburg lamented the latest tragedy but had no doubts about the safety of the plane.